What is Slow Living? | Sponsorship | Summit | Who’s Coming? One-day rate $120 — available for Thursday June 5 or Friday June 6. 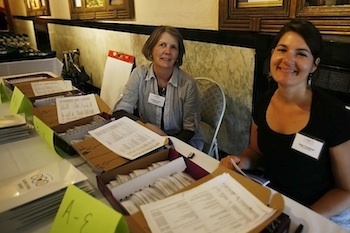 One-day registrants may add Wednesday evening reception and plenary for an additional $25. Stipended scholarship application rate: $35 — We are seeking sponsor support for a limited number of scholarship stipend slots for people unable to afford any of the above rates. Registrants will be asked for a brief statement outlining need. Acceptance is by committee approval and subject to stipend availability. Issuance to approved applicants is on first-come basis. Denied applicants may receive a refund or upgrade to rates that were in effect at time of stipend reservation registration. Stipend rate applications will be available through April 30 only. Local limited means rate $105 subject to availability. Stipended scholarship reservations continue through April 30. Local limited means rate $125 subject to availability. Stipended scholarship reservations will no longer be available. Once the registration info is completed, click “Submit” and you will be taken to the Strolling of the Heifers PayPal page. YOU DO NOT NEED TO HAVE A PAYPAL ACCOUNT. You can pay with a major credit card at the PayPal page. The Summit is a non-profit, volunteer-driven effort. We make every effort to keep our rates low and affordable. If you are able to make a contribution in addition to the registration price, it will help us to provide stipended scholarship registrations to people of limited means, as well as to launch the Slow Living Leadership Institute. Please click the Submit button only once! If you are not directed to PayPal, check that all the required fields are filled in.